Bubbler systems use perforated tubing placed at the bottom of the water around a boathouse, dock or wall. When using diffuser lines to protect your dock from ice damage there will be some fairly common installation procedures: place the air compressor in a ventilated cabinet or shed and run an airline to the structure where a weighted bubbler hose is placed at strategic points around the dock or against the wall. Almost all natural ponds, with or without aeration, will go through a series of classic stages with the changing seasons of the year. If you have had a pond for a number of years you may be familiar with some of the processes that take place during the year and if your pond has become stgnant or smelly you likely have read about how aeration can help with the health of your pond. In the spring in most Northern ponds, as ice and snow begins to melt from the surface of the pond due to the temperature rising with with the longer hours of sunshine, several distinct processes start in your pond that may lead to the degradation of the water quality in the pond. Many natural and man-made ponds when not properly aerated will see water stagnate and the water temperature tends to remain at a very uniform level; warm near the surface and cold yet oxygen starved at the bottom. When adding the circulating benefits of aeration we can reverse many negative changes that occur in a pond including build-up of algae and bottom muck. For instance, if you add a lake bed style bottom diffuser aerator the rising water column creating by the bubbling diffuser of your aerator will help to circulate and mix the pond water. Without the bubbling action of this sort of air-compressor driven aerator the pond water will only be slightly mixed by blowing winds across the surface and this typically only affects the top levels of the pond. Lower depths remain untouched and the temperature tends to remain constant and the oxygen levels can remain low which can cause the release of phophorous and other detremental bottom sediments. A surface aerator can be helpful in that it will not break the thermocline and using a surface aerator will ensure that delicate fish will not become over-heated. Using a thermostat controller on your bottom mounted aerator also reduces the risk of fish-kills. As the spring runoff starts to deposit plant nutrients and organic sediments from the shoreline, many un-wanted byproducts of agriculture and human over-population can cause an imbalance in the eco-system and these nutrietns which settle in the pond can lead to filamentous algae or green water and other common pond problems. Without adequate circulation in the pond or lake these sediments will collect on the bottom of the pond and begin decomposing or chemically altering the composition of the pond sediments which can, under the proper seasonal conditions, lead to algae blooms that can disturb the peace and natural balance of the pond. If left alone, over time, with the oncoming warmth of summer you will quite possibly see these additional nutrients begin to encourage a rapid growth of algae, bottom muck, and often cloudy green pond water. Without the best form of aeration to assist the winds attempts in natural circulating of the pond water, the suns summer rays will warm the upper levels of the pond while warm, oxygen lacking water will stay below on the colder deeper water which often is unsuitable for fish due to the low dissolved oxygen levels. The un-aerated pond may started to develop bloomd of surface algae which restricts the penetration of light rays to merely the surface of the pond so that oxygen producing bottom-rooted plant life cannot grow. 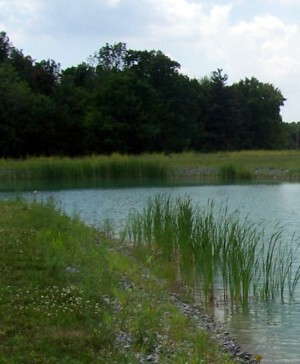 At the same time, having too many nutrients that combine with clear waters and constant sunshine can lead to excessive pond weeds that can create thick choking weed mats that float to the surface and spoil the pond due to their invasive aquatic weed nature. Without an aeration system often the pond water is beginning to lack oxygen and large amounts of this floating, hairlike algae die, settle and then decomposeto the bottom of the pond where the still oxygen lacking waters become the perfect medium for the collection of noxious gases and nutrients that turn the sediment into a poisonous mix that can harm fish and other aquatic creatures. Using a surface aertor like a fountain or bottom mounted diffusers, often called lake-bed aeration or even an aerating windmill will keep the layers of the pond in a constant mixing motion which prevent the surface algae from building up and preventing the suns rays from helping grow the necessary oxygen delivering plants. Care should be taken to not stir up the pond like a washing machine as certain species of fish like trout for instance prefer colder waters and by using aeration 24 hours per day you may actually cause the waters to overheat which can cause serious health issues or mortality to fish. Such destructive cycles can worsen in the long hot days of North American summers as we experience steady days of high temperatures and often the green algae consumes all of what remains of the ponds diminishing oxygen and nitrogen supplies and algae begin to die and drop to the bottom of the pond. Not all algae in a pond is bad and under these extreme warm conditions the healthy green algae can replaced by blue green algae which is undesirable and often toxic for the pond. Blue-green algae can grow without nitrogen and will soon dominate the pond; the proliferation of blue green algae in our lakes and ponds is a growing concern and luckily private pond owners can rectify the problem easier than municipalities who must bow to municipal and government regulations that often prohibit the installation of aeration systems and the use of beneficial bacteria to help curb and reverse the problems of eutrophic lakes and ponds. Continuing in our look at the pond; the beneficial green algae, yes, not all of it is bad for our ponds, which dies and settles to the bottom of the pond begins to decompose and consumes the little remnants of oxygen that cannot be replaced since there is no aeration. To introduce fresh oxygenating air bubbles from the bottom diffuser assembly or from a windmill airstone or even an aerating fountain will assist in keeping the pond well mixed and the steady supply of oxygen can envigourate the fish which will heartily empower the entire aquatic eco-system. Scientific studies have shown that when we introduce the cleansing agitation from an aeration system and the mixing is taking place in the pond we find the layer of potential nutrients such as nitrogen and phosphorus and such metals and manganese and iron will actually become sealed and trapped in the sedimentary sludge on the pond floor as if a protective layer encapsulates these unwanted substances and they are banned from harming the pond! An aeration system strategically placed in the pond floor can assist in preventing this settling of noxious muck which could form a layer of septic sludge and lead to water of extremely poor quality. To determine if a surface aerator or bottom mounted aerator is best suited for your pond it is recommended that you speak to a qualified pond expert in your area. Every pond is different and while certain rules apply there are, as mama used to say, many ways to skin a cat and twice as many ways to aerate a pond in the wrong manner! Let's get back to the seasons..with the autumn equinox bringing cooler temperatures to your pond, and if you only have the wind to perform any water mixing and circulating we can only expect limited improvements in the water quality. Again this is why winter aeration and fall aeration cannot be discounted especially in areas of northern latitude where we have distinct seasons because in these conditions, as the newer algae begins to die and sink to the bottom they once again decompose and consume the available oxygen in the pond which, if there is no aeration, is severely limited. Once our winter comes in like a white coated dentist and the frosty bellows of cold begin to allow ice and the ice forms on the pond only a tiny amount of oxygen can actually diffuse through the surface of ice. Of course, fish are at a state of reduced metabolism so the issue of oxygen for fish is not a prime concern although to prevent fish-kills it is best to maintain an open hole from an aerator in the ice to allow a "breathing" of the pond...the escaping gases that are released through the ice hole are better allowed into the atmosphere instead of being trapped below the ice. Even in the cold the cycle continues and the decomposing algae in the pond are constantly consuming what little oxygen remains and once again a detrimental layer of nutrients and metals begin to form an ever increasing layer of harmful sludge on the bottom. As was stated earlier, the bottom mounted diffuser can help remedy this collection of bad build-up. When the oxygen supply in a pond is sufficiently reduced you will may notice the stink of hydrogen sulfide (that horrible rotten egg smell), bad taste (if you brush your teeth in the pond) , muck and scum build-up and maybe unusually high fish kills. Installing either a homemade aeration system or a turn-key system offered by many pond supply stores will keep the ice from completely closing over during the cold months and not to mention the continuous supply of oxygenating bubbles during the winter enhances and promotes the natural breathing of the pond. 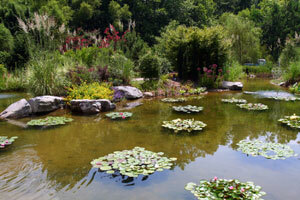 This constant approach to pond maintenance will ensure that the water in the pond retains its clarity and all of the the beneficial organisms including healthy bottom rooted plants and cleansing algae will flourish and keep the pond alive and the water quality high for bathing, drinking, swimming or any appropriate use. Of all the treatments for ponds, lakes and watergardens that exist one of the most critical may be ensuring that an efficient aeration system is in place. Of course not all ponds will require one but even a pond that has been perfectly designed may suffer the occasional ills due to seasonal influences but before reaching for drastic measures like algaecides or copper-suplhates it may be only a question of adding a simple and inexpensive aeration system.